An enthusiastic group met at the Imperial Chinese Restaurant on Oct. 18 and welcomed a new member and a future member. 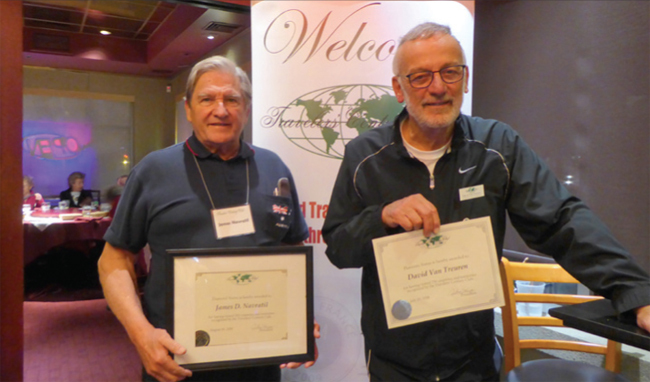 We recognized two well-traveled members who have reached higher country levels: David Van Treuren has reached the Platinum level, and James Navratil has reached Diamond level! Congratulations to both of them. David Van Treuren spoke about his March 2018 cruise that included stops in the Falklands and South Georgia Islands. He shared fabulous photos of many species of birds, penguins, and other wildlife that he encountered, as well as beautiful landscapes. We have learned that the funeral service and burial for our Colorado Chapter founder, Bonnie O’Leary, will take place on Nov. 19 at Arlington National Cemetery in Washington, D.C.
Our first meeting of 2019 will be held on Jan. 17.